E. Randolph Richards (PhD, Southwestern Baptist Theological Seminary) is dean of the School of Ministry and professor of bible studies at Palm Beach Atlantic University in West Palm Beach, Florida. Brandon J. O’Brien is editor-at-large for Leadership Journal and is completing his doctorate in theological studies at Trinity Evangelical Divinity School. As we seek to interpret and apply Scripture, there is always the danger of reading our own culture into the text. That is the issue that Richards and O’Brien aim to address in this book. Their main contention is that in every culture there are “things that go without being said” (12). This is even true of the Scriptures. When we come to those “gaps” in Scripture, we instinctively fill them in with a piece of our Western culture, rather than understand what would have “went without being said” in that non-Western culture. “When we miss what went without being said for them, and substitute what goes without being said for us, we are at risk of misreading Scripture” (13). 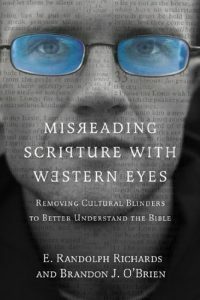 To help Bible readers better grasp these gaps in meaning, the authors identified nine main differences between Western and Eastern cultures. Like an iceberg, some of these differences are obvious, while others are deep beneath the surface (16). In part one, the authors discuss obvious differences in mores, race, and language. In part two, they discuss less obvious distinctions between individualism/collectivism, honor/shame, and time. In part three they address differences in relationships, vice, and personal application that may not be obvious at all. The book gave helpful summaries of the differences between Western and Eastern culture. And it began with a promising example of “things that go without being said”; it noted the hot springs of Hierapolis and the cold spring of Colossae that Jesus, through the apostle John in Revelation, was likely alluding to when he rebuked the Laodiceans (who lived in the middle of those two cities) for being lukewarm (10). Unfortunately, more often than not the authors seemed to go to other extreme, and misread the Scriptures with Eastern eyes. Sometimes, they read Eastern culture into the text. For example, because of an honor/shame culture that was more concerned about public shame than personal guilt, they claim David felt no guilt about murdering Uriah. In fact, he felt justified because Uriah (who knew that David had slept with his wife) didn’t allow him to save face publicly by sleeping with Bathsheba when he returned home (120-124). The authors also claimed that Paul was a tent minister mainly because of patronage culture, which would obligate him to stay at a congregation because of their support. In fact, when in Philippians 4 Paul talks about not being in need, by reinterpreting the Philippians’ gift as a gift to God (not him), he was really just trying to politely get out of the strings attached to their gift (164-165). At other times, the authors seemed to ignore the context of the text all together. For example, because “grace” and “faith” in Paul’s day were common words used in a patronage culture, “grace” and “faith” should be understood more in terms of “relationship” than a “forensic decree” (167, 173). Even though the context of the parable of the rich fool indicates that the sin Jesus was condemning was greed, the authors claim that in an Eastern culture that looked down upon hoarding, the unsaid vice he was actually condemning was not sharing his abundance with those in need (188). Although the context of 1 Corinthians 1-2 clearly indicates that the preacher preferences in the church were focused on human wisdom and rhetoric, in a culture where being racist wasn’t taboo, the authors suggest that the Corinthians were divided between Paul, Cephas and Apollos for ethnic reasons (66). Furthermore, the authors’ views at times seem based more on their experiences working as missionaries in Indonesia rather than on the historical context. Because Eastern culture does not value privacy, they claimed that the Garden of Gethsemane was likely packed with people on the night that Jesus was betrayed (78). Because Easterners value time differently than Westerners, they claimed that Joseph likely stayed in Bethlehem for two years because of work opportunities (144). But there were no references to historical examples of people living like this in Bible times. Instead, the authors merely referred to examples of Indonesians they encountered following these cultural norms. Finally, though in the introduction the authors maintained that their purpose was not to offer detailed exegesis, but just raise questions and let the reader draw their own conclusions (16), they often spoke conclusively about their interpretations. Though scholars have debated (and debunked) whether Paul’s words “you foolish Galatians” in Galatians 3:1 were an intentional ethnic slur, the authors said definitively that it was (58). After describing how ancient letter writing was typically a public and collaborative project, instead of merely suggesting how this might change our view of how Paul composed his letters, the authors said it was doubtful that Paul’s letters were an individual project. Rather, they were likely dictated to a scribe in a public place, with coauthors actively contributing and family and friends stopping by to listen and offer advice (101-102). In a recent Seminary online course on hermeneutics, we were reminded that though the historical context of Scripture may enhance our understanding of a text, it should never supplant what the text says. Unfortunately, this is exactly what Misreading Scripture with Western Eyes consistently does. Therefore, this reviewer would not recommend it for a pastor’s study.